If, on the night of Feb. 20, Lynne Ambrosini had emptied a champagne flute a few times and then triumphantly thrown it into a fire, anyone who knows her would have understood. For nearly 15 years, Ms. Ambrosini, the director of collections and exhibitions and curator of European art at the Taft Museum of Art in Cincinnati, had been trying to organize an exhibition about the evolution of the 19th-century French artist Charles François Daubigny. The idea germinated when she worked at the Minneapolis Institute of Art, where she had pondered what she called two "staggeringly different" paintings he made 27 years apart. In 2002, she had been hired by the Taft as a guest curator to develop a Daubigny show, and later joined the staff full time. She worked for three different directors and revised her vision for the exhibition four times. She traveled to 105 cities, some more than once, to do research and study paintings that might best fit her thesis. When costs escalated, she had to persuade two much bigger institutions to collaborate with the Taft, a gem of a museum with a collection of only about 700 works (among them, though, are paintings by Rembrandt, Whistler and Sargent and an exquisite 13th-century ivory statue of the Virgin Mary). That prompted more modifications to her plans. But her tenacity paid off on Feb. 20, when "Daubigny, Monet, Van Gogh: Impressions of Landscape" opened. Ms. Ambrosini had grown ever more convinced that Daubigny was not only a forefather of Impressionism who had never been given his due, but also an important innovator, although he had never had a major international exhibition of his own. This exhibition addresses both issues. It pairs some of his pathbreaking paintings with similar ones by Impressionists, and it will travel to the National Galleries of Scotland in Edinburgh and the Van Gogh Museum in Amsterdam. "Lots of times I felt, 'That's it, I'm done with this project,'" Ms. Ambrosini said. Then she would remember her goal. "I know the show will be very revealing," said Lawrence W. Nichols, a senior curator at the Toledo Museum of Art, which is lending both its sole Daubigny and one of its two van Gogh paintings. "I'm glad, and so is the profession glad to see it come to fruition." In Impressionism's origin story, Daubigny sometimes merits a mention, but not the attention given to Camille Corot, Gustave Courbet and others. Ms. Ambrosini herself wasn't thinking of Daubigny's influence at first. She began around 2002 to organize a monographic exhibition, scheduled for 2005 and intended to show how his early works, which favored greens and browns and featured finely defined outlines, evolved into the brushy images and brighter colors of his later years. "I wanted to see what were the changes and what were the technical processes involved," she said. But soon her work came to a halt. The Taft had opened expanded galleries in May 2004. Its main donors were tapped out after that project. Without funding, the Daubigny exhibition was postponed indefinitely. Ms. Ambrosini tried a new idea: She enlisted the Cincinnati Art Museum in a more comprehensive exhibition for 2009 that the two museums would split, sharing the costs. But in June 2006, the leadership changed at both museums. "The whole exhibit was dead," she said. By 2007, the Taft had a new director, Eric Lee, but then came the deep recession. "We were hard pressed to meet operating expenses," Ms. Ambrosini explained, and there was no money for Daubigny. 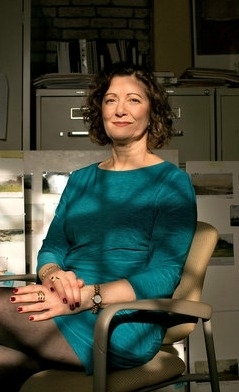 Mr. Lee left to head the Kimbell Art Museum, and in November 2009, Deborah Emont Scott succeeded him. She approved the exhibition in spring 2010, but mindful of cost, Ms. Scott told Ms. Ambrosini to cut back the checklist to 55 paintings from 80. Then came another setback. When Ms. Ambrosini presented her proposal to a group of trustees, some had never heard of Daubigny. "They challenged me to say who he was and why he mattered," she said. She was ready with an answer. She had discerned, for example, that Daubigny's 1857 river scene, owned by the Fine Arts Museums of San Francisco, had been created in one session, wet paint into wet paint. It was a pivotal revelation. "I realized that this was painted on the very first trip on his studio boat," she said. Daubigny's use of the boat to change his vantage point as he painted on board is reflected in many of the river paintings that followed. His vessel, for instance, was a model for Monet's studio boat. She had also learned, from studying paintings with conservators, that Daubigny was an early adopter of new synthetic pigments and other practices later taken up by the Impressionists. But when she explained all this, the trustees thought the exhibition should include Impressionist works. "I was concerned about the costs," she continued. "But they said we have to do it right." At this point, she had to cut to 40 the paintings by Daubigny and to add 15 Impressionist works that made her point. She also had to find two museums that would share the costs of the show. Between 2010 and 2012, she went back on the road to find the new paintings and partners. 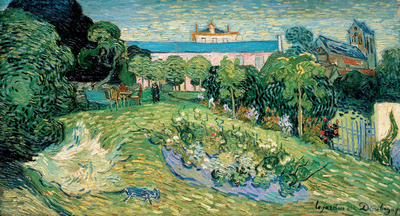 That is when van Gogh, who had painted Daubigny's house and garden in homage, entered the picture. Ms. Ambrosini knew a curator at the Van Gogh Museum in Amsterdam, and in July 2010, she traveled there to make her pitch. The museum signed on in December of 2011, and the exhibition was set for 2015. Ms. Ambrosini also knew sympathetic curators at the Scottish National Galleries, and in March 2012, she met with officials there. They liked the idea but would join in only if the exhibition were postponed a year. All three museums agreed in December 2012. Now the project was changing again, though, with five curators instead of one. Eventually, they agreed on common paintings, with some local differences, and a common catalog. "Daubigny, Monet, Van Gogh," the most costly, most ambitious exhibition in the Taft's 84-year history, is a milestone, but not because it will make a lot of money. The galleries can safely hold only 45 people an hour, so tickets are limited. Rather, Ms. Scott said, it's important for the region — "Most of these paintings have never been seen in this part of the country" — and it's important even for small museums to undertake scholarship. As for Ms. Ambrosini, the producer of that scholarship, she didn't break any glasses after the opening. But she did tell Ms. Scott that she would be taking a day off.